If you’re interested in Sage FAS 100 fixed assets and would like more information without having to go through a salesman who is going to call you daily to ask “are there any more questions I can answer” — aka “Are you ready to buy?? 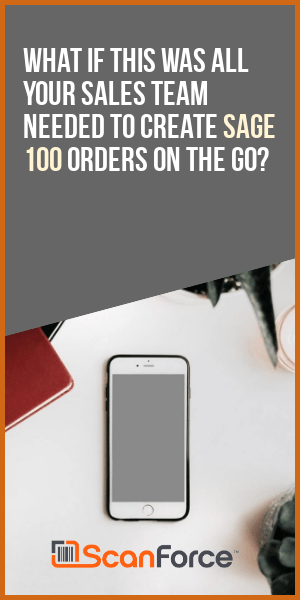 !” – then navigate online to this self-running FAS 100 presentation. The Sage FAS Asset Accounting family provides easy-to-use fixed asset accounting, depreciation, and reporting features for businesses, governments, schools, and nonprofit organizations. Standard and customizable depreciation calculation methods help your business or organization optimize balance sheets, reduce insurance overpayments, and maximize tax savings. With a comprehensive depreciation engine containing more than 300,000 IRS and GAAP rules, FAS Asset Accounting makes managing the lifecycle of your company’s fixed assets – from acquisition to disposal–fast, easy, and accurate. FAS Asset Accounting eliminates the time and energy it takes to manually perform the necessary accounting procedures, allowing you to focus on other tasks. Sage FAS has budget-friendly versions to meet the specific needs of your organization – from single-user, multi-user, or Microsoft® SQL networks, to the number of assets in your organization. FAS Asset Accounting can be customized to work to meet the specific needs of any business process with user-definable fields, “Smart Lists,” Asset Templates, and more. The web session requires no pre-registration and takes you through some of the key points of Sage FAS 100 Fixed Asset software. The demo starts with an overview and features a live tour of import and export, setup and daily fixed asset operations. 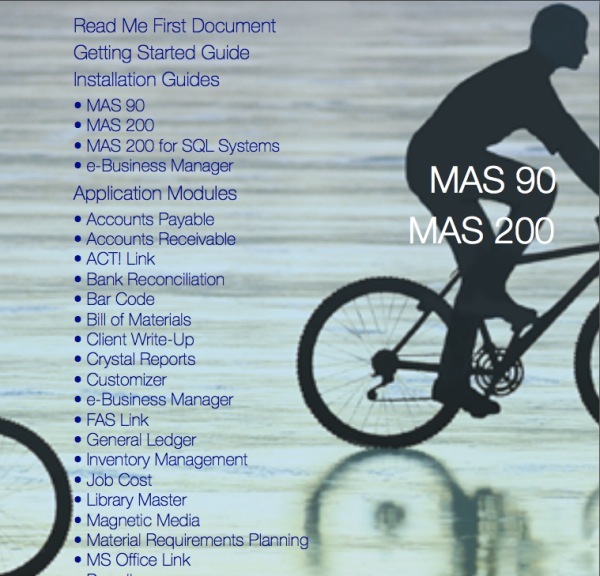 Have you been searching for a MAS90 manual to take home and read? Product manuals for Sage MAS 90 and MAS 200 are no longer available in printed format. Sage software stopped shipping manuals with version 3.71 and instead has included all the information in their help files. Several clients have said that they prefer to the paper manuals over help files since they can print off the manual to take with them when they are away from the computer. Fortunately, there is a way for you to view printed manuals for Sage MAS 90 and 200. Although the manuals are a little dated, there is an active link to all the Version 3.71 documentation which can be downloaded to your computer (or printed out). 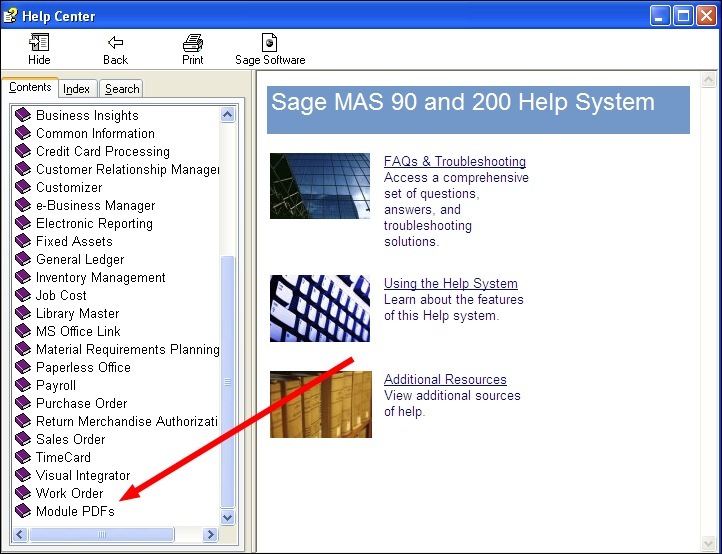 Access the Sage MAS 90 version 3.71 version of the product manuals at this link – MAS90 Manuals. 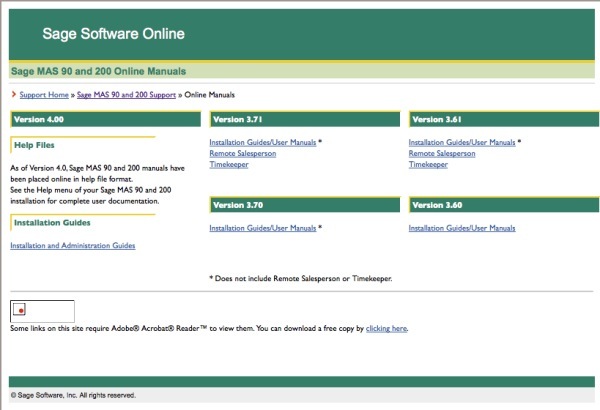 Another way that users can access a more updated set of documentation is directly from their Sage MAS 90 or MAS 200 help screen. If you would prefer to review the available courses on your own – navigate to http://www.sagesoftwareuniversity.com or simply follow this link directly to the Sage Software MAS 90 self-study materials list. 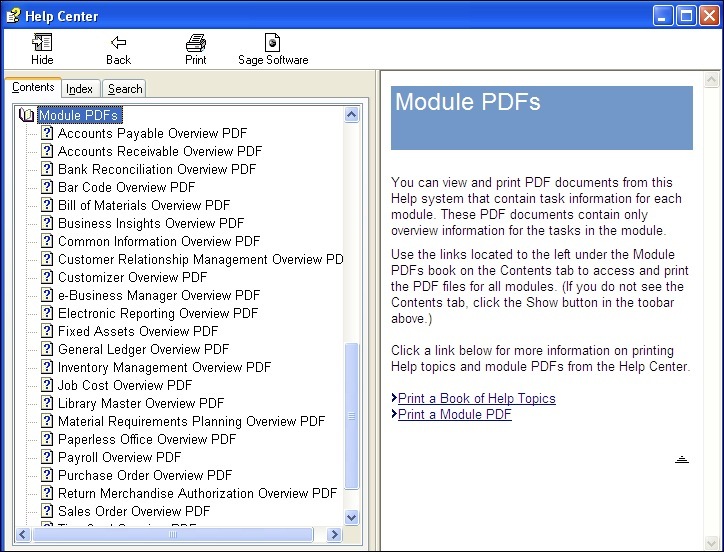 Open your current version of Sage MAS 90 or MAS 200 and select Help – Help Topics – and then scroll down the Contents to the very bottom where you will see a “Module PDF” item. Click on the “Module PDF” link and you’ll be able to view the list of all the help files (already in PDF format) from which you can view online or print to hard copy. These are essentially compilations of the help files – so they’re a little less detailed than what you have available in version 3.71’s PDF manuals. If these manuals are not enough information, our advice is to consider the Sage Software self-study guides. These are courses sold directly by Sage Software that document the processing procedures within Sage MAS 90 or 200. Although they’re sold as a study course, we have many clients who have found them to be very useful as an ongoing resource when trying to learn a new feature in their accounting software. Your Sage Business Partner can provide you with information about the self-study courses. If you prefer, you can browse to http://www.sagesoftwareuniversity.com or view the list of available MAS90 self-study guides directly by following the links. Sage MAS 90 on a MacBook Pro? Are You Nuts?! .The answer is yes. I use VMWARE Fusions which creates a virtual Windows XP box on my desktop. From within VMWARE I can run any Windows XP compatible application. Granted that I don’t run MAS90 in a production environment on my MacBook Pro (my use is limited to support questions and testing). I have a stray client or two that runs older MAS 90 versions on a MacBook with no reported issues. Of course the Apple Leopard OS includes a free utility called BootCamp which will allow you to dual boot either Apple or Windows OS. The issue with BootCamp is that it’s an either/or boot. In order to swap operating system usage you must reboot your Mac. The most common way around this is to use virtualization software (such as VMWARE or Parallels) that create a large partition on your Mac and supports running multiple operating systems simultaneously. Before you jump and buy a Mac, realize that Sage Software does NOT support Sage MAS 90 on any platform other than what is in their official supported platforms matrix. The two most common programs for running Mac and Windows on the same hardware are Parallels and VMWARE Fusion. See the links below for more information. Both programs are available for under $100. You will need to supply a copy of the OS. For that purpose I strongly recommend obtaining a membership in Microsoft Technet which provides for evaluation licenses for the different Microsoft operating systems (Technet is a $349 initial subscription and $249 renewal). Tip: Another way to run MAS 90 or MAS 200 on a Mac platform is via Citrix or Terminal Server.